Home » Uncategorized » Sports Acupuncture – Can It Benefit Strength Athletes? Acupuncture is a form of traditional Chinese medicine (TCM) that has long been sought after for its proposed benefits for the body. Its been around for nearly 2,500 years, and is one of the many ancient practices that continues to grow with the ever changing health industry. Every needle I put in, I have a reason for it. It’s not just a concept, but a reason with scientific backing. Being the skeptic I am, I wanted to learn more about this ancient form of Chinese medicine. 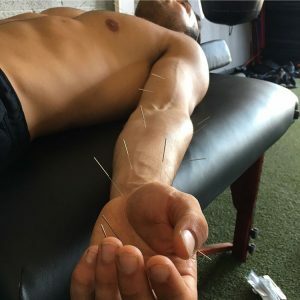 I reached out to Peter D’Aquino L.Ac M.S., Diplomate In Oriental Medicine, of D’Aquino Acupuncture to learn more about how sports acupuncture might benefit the strength athlete. There’s still a lot of research needed behind sports acupuncture specifically. This article isn’t intended to endorse the practice or suggest having the treatment done, but to have an open conversation with one of its practitioners to learn more.